Measuring hydrostatic liquid level is normally carried out using a vented gauge reference pressure sensor. However, venting the inside of a pressure sensor to the outside air is not always possible and failures can be caused by internal condensation. When measuring the water level in a freshwater reservoir for example, the hydrostatic pressure sensor is measuring both the pressure of water above its position and the atmospheric air pressure acting on the surface of the reservoir. Normally a vented reference would be used to equalise the offset due to atmospheric pressure so that the true water level is measured. However if it is necessary to use an absolute hydrostatic pressure sensor this is not possible and the atmospheric pressure has to be measured at the surface and taken away from the reading of the absolute hydrostatic pressure sensor. In geotechnical applications for example where there are several submersible borehole level loggers or sensors installed within a local area, only one barometric pressure sensor is necessary to compensate all the other level instruments. This can work out much lower cost especially with deep boreholes where the cost of vented cable and desiccant packs outweighs the cost of one extra barometric pressure logger or sensor. Where there is a ratio greater than 10 to 1 between the hydrostatic pressure and the barometric pressure, no significant additional errors will be introduced over the vented gauge reference method as longs as both pressure instruments are of a similar accuracy grade. But when the liquid level range falls below 100 metres, the barometric pressure compensation starts to play a bigger part in the error budget eventually increasing the errors effectively by 300% for a 10 meter level range for instance. This disproportionate increase in accuracy is caused by having to use a 2 bar absolute range to measure a 10 metre (approx 1 bar gauge pressure) level range plus a barometric range of approximately 1 bar absolute. So if it is assumed that each sensor has an accuracy of 0.1% full scale the overall error will be 0.3% full scale when compared to a vented hydrostatic level instrument with a level range of 1 bar gauge (10 mWG). The atmospheric pressure is effectively being measured twice and as the level range reduces it becomes the dominant component of the total error. This becomes even worse with level ranges between 1 and 10 meters of water and quickly the economical and practical benefits of using an absolute hydrostatic pressure instrument become over-shadowed by the severe degradation in accuracy. 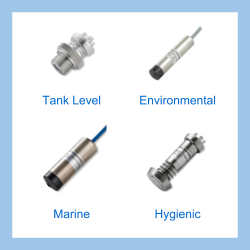 Send us your enquiry for a product associated with this Using absolute pressure sensors to measure hydrostatic level page, and get assistance with selecting a product for your application.